Huawei also entered into partnerships with tech heavyweights to enhance capabilities of its new phones. Chinese electronics giant Huawei has launched two new smartphones in South Africa following last month’s global launch. Speaking at the launch in Cape Town on Monday night, general manager for Huawei consumer business group SA, Likun Zhao, said Artificial Intelligence (AI) was no longer a virtual concept, but something that intertwines with daily life and can enhance user experience, provide valuable services and improve product performance. “The Huawei Mate 10 Series introduces the first mobile AI-specific Neural Network Processing Unit (NPU), launching a new era of intelligent smartphones. For the South African market, we are bringing in our two premium phones in the series as we believe these are the best phones to meet the mobile needs of tech-savvy South African consumers,” Zhao said. Huawei also entered into partnerships with tech heavyweights to enhance capabilities of its new phones, including software giant Microsoft, LinkedIn, and premium camera manufacturer, Leica. Locally, Huawei is also embarking on a partnership with Standard Bank, with a focus on the Mate 10 Pro and Porsche Design Huawei Mate 10, which will be featured in VIP financial offerings for Standard Bank customers who purchase Huawei devices on various uniquely designed offerings. 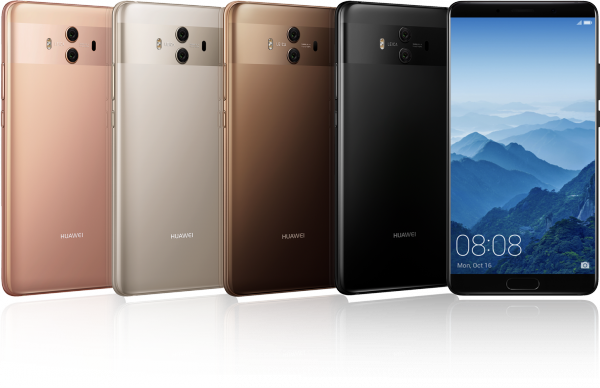 The new Mate 10 Pro and Porsche Design Huawei Mate 10 devices are breakthrough AI phones that combine innovative hardware, the Kirin 970 chipset, and an all-new, simplified EMUI 8.0 based on Android 8.0. Additional key features include a 6-inch screen display, a 3D glass body, water and dust resistant exterior, a super charge, an AI-powered battery management to maximise battery life, and low-voltage fast charging. But consumers will have to dig deep as the Huawei Mate 10 Pro will retail for R17 999 while the Porsche Design Huawei Mate 10 goes for R26 999.